When Sergio Mata’u Rapu introduced his documentary Eating Up Easter to his home island of Rapa Nui, also known as Easter Island, he was scared. His passion project of seven years was about this remote territory of about 8,000—including his relatives and people he was in community with—and the immense difficulties they faced. Over the past few decades, Rapa Nui has been buried in plastic and trash washing ashore in addition to the mire from its own insufficient disposal systems. Even as this crisis has been happening, more than 100,000 tourists have begun visiting every year, up from 14,000 in the mid-1990s, spurring an explosion of development and creating ripples across the Rapanui culture. As Rapu put it, the island premiere was akin to making an epic home video spilling all of the family’s dirty laundry and then showing it for Thanksgiving dinner. The island premiere was a mere two weeks ago, presented with the awareness event Swim Against Plastic, and the world premiere of Rapu’s film was a few months earlier at the November 2018 Hawaii International Film Festival. Now Rapu’s current home of Minnesota is up to bat. Eating Up Easter will be screened at the Minneapolis-St. Paul International Film Festival on April 14, 17 and 21 (in Minneapolis, St. Paul, and Rochester, respectively). At all three screenings, you can get the chance to meet Rapu, who directed and produced the film, and for at least the Twin Cities screenings, you can also meet his wife Elena G.K. Rapu, an anthropologist and filmmaker who co-produced and wrote for it as well. Eating Up Easter does not cover every change the island is going through, but it shows people living in the heart of it. You meet Mama Piru, an ecologist who ran the recycling plant on the island and who was one of the community’s most prominent figures. You meet Mahani Teave and Enrique Icka, two musicians trying to open a no-cost cultural music school. And you meet Sergio’s father, Sergio Rapu Haoa, the island’s first native governor, one of the first Rapanui ever to be educated in the U.S., and one of the restoration leaders for Rapa Nui’s famous statues. He wants to build a shopping center in the middle of town because he believes that if the Rapanui do not steer their own modernization, someone else will. Out of the central characters in the film, Haoa is the most reserved when the camera is rolling. Everything he says is honest, but he reigns himself in much more than in off-camera conversations. Like Mama Piru, Teave, and Icka, Haoa is a man who wants to do the best for his people, but as a leader, he doesn’t want to be portrayed as someone “on a side.” He wants to be someone who can mediate and build bridges for the community. In editing the film, Sergio and Elena didn’t want to diminish anyone’s varying viewpoints, either. “There is no clear path forward. They all are doing what they think is right, and there’s benefits to all of those approaches. So maybe it was sort of a tribute to [Sergio’s] dad that we took a similar approach to the film,” Elena says. What connects these sometimes contradictory characters is Sergio’s narrative to his oldest son, Koa. When Sergio and Elena began working on Eating Up Easter, neither Koa nor his baby brother were born. As the film reached its editing phase, though, it needed something more to bring it purpose. When Sergio came across his personal footage of Koa being born, he knew he found it. Parenting changes everything. Just as Sergio wanted to show the world what Rapa Nui was really like, he wanted to share his world on the island with his family. 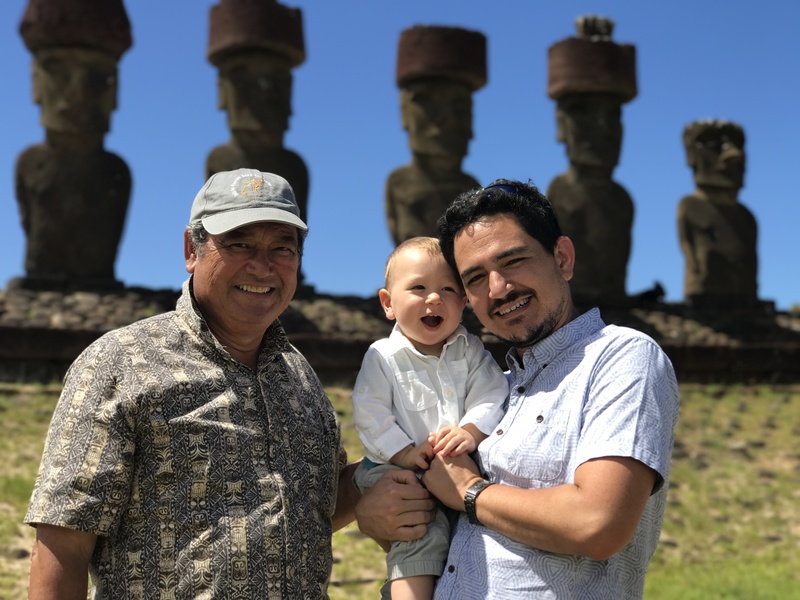 His sons are going to grow up in Minnesota, and even though Rapa Nui is far away, Sergio and Elena want to pass on their love for—and their responsibility to—the island. Originally, the film was not going to be about the environment, but rather about the lack of food security on the island. Sergio had seen an article about how Hawaii was so dependent on food imports that, left on its own, it could only survive about a week. He guessed Rapa Nui would not fare much better and set about making a documentary to show people its plight. While studies are hard to come by, Sergio feels he can confidently say at least 70 percent of the island’s food is imported. As he, Elena, and the rest of the team went about researching and talking to farmers and restaurant owners, the conversations kept circling back to all of the cardboard boxes, plastic bottles, and storage containers the imported food was arriving in. To get a visual, Sergio and Elena went to the recycling center, and there they met Mama Piru in her full glory. So they did. Eating Up Easter is about the environment, about culture, about change. It’s about adaptation and trying to untangle the good and the bad in life’s most complex problems. Before Sergio and Elena got to show their island the snapshot of their lives, Mama Piru died in September 2018. So many of her family got to see the film, though, and many came up to Sergio and Elena to give them a hug, touched by how Mama Piru’s force exuded from even these 76 minutes. She left her legacy on the island and moved hundreds of people through her passion. Perhaps, with Eating Up Easter, people outside of the island can be moved to think about how their legacy marks this earth, too.